Looking for an alternative to the traditional meat and potatoes St. Patrick’s Day dinner? Try this fresh and hearty Lasagna Verde. 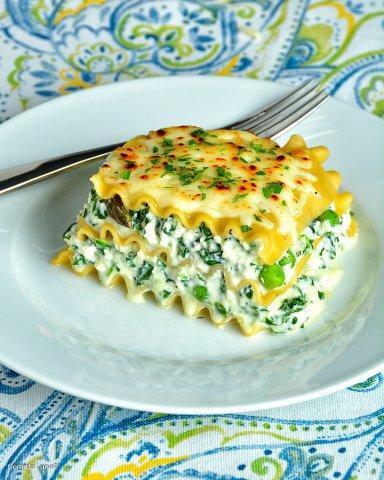 This fabulous green lasagna is filled with layers of fresh spinach and asparagus, sweet peas, creamy ricotta, parmesan and mozzarella cheeses. It’s a festive dish for St. Patrick’s Day or any day of the year! Step 1. Bring a large pot of salted water to a boil. Cook the lasagna noodles according to package directions. Drain, toss with olive oil to prevent noodles from sticking, and set aside. Step 2. Preheat oven to 350ºF. Place the spinach in a large pan over medium heat. Add ¼ cup water to the pan, cover, and wilt; 1 minute. Thoroughly drain spinach. When cool enough to handle, roughly chop it and squeeze out the excess water. Step 3. Place spinach in a large bowl with the ricotta, eggs, garlic, zest, nutmeg, peas, asparagus, Parmigiano-Reggiano and half of the mozzarella. Season to taste with salt and pepper. Step 4. Place half the noodles along the bottom of a 9” x 13” pan. Top with half of the ricotta mixture. Repeat with remaining noodles and ricotta mixture. Step 5. Sprinkle remaining mozzarella over the top. Place in the oven and cook until heated through (about 30 minutes).